Some of the best real estate agents in the business today know how important it can be to go outside your comfort zone in order to keep — and retain — profitable clients. Getting stuck in a rut with the same strategies that only bring you moderate success isn’t the best way to earn more. Instead, challenge yourself to get comfortable with being awkward and taking chances. Here’s are ways that top performing agents and brokers suggest getting outside your comfort zone. It’s not an option to avoid social media in today’s real estate landscape. The best real estate agents find a way to learn social media and embrace it, even if it means they spend some time at the beginning unsure of what they’re doing. “What I did to go outside of my comfort zone when I started in real estate was to set up my Instagram account,” said Shelton Wilder, who’s made waves in the real estate industry on her own terms. She also committed to starting a weekly video series that she uses to engage her clients and prospective clients across all social media platforms. “That was really hard at first, but now I do it every week. That consistency has helped me grow my Instagram presence as a real estate expert. That has paid off by letting me get in front of potential clients so that they can get to know my personality and see how committed I am to real estate. It also demonstrates that I work every day on my business,” she said. It could feel awkward to constantly be chasing referrals from people who know you or past clients. No one wants to give the impression that they’re too pushy. Yet the best real estate agents consistently report that referrals are a strong source of business. Fallane Jones, of The Property Girls Team, said they’ve recently decided to automate more of their business so they can spend more time developing high-quality leads. Your sphere, however, does take time to develop, and it can be awkward. “I’ve always been hesitant about approaching my friends and family about real estate out of fear that I come off as “sales-y”. I think the fear of being rejected by someone you know is also a fear for most agents,” said Jones. Some people naturally excel at branding themselves, while others have a hard time telling their story and conveying their expertise to others. Amy Herman, who has worked in New York City real estate since 2002, has been quoted in many major publications to establish herself as an expert in her field but she knew the next step for her was public speaking — something she dreaded. “I needed to break through and speak to influential people as I look at my boss who does it all the time and people truly value when an expert in their field presents information and answers questions from an inquisitive audience,” she said. Real estate agents who excel in their field aren’t doing so by accident. 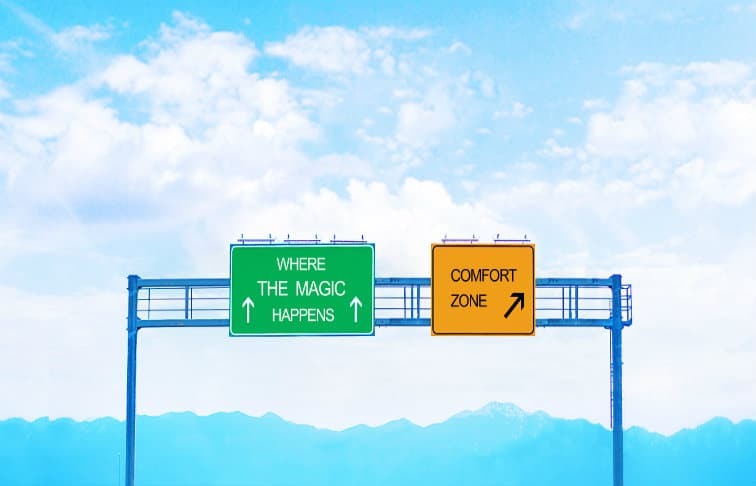 They have a common trait – the willingness to keep taking steps that are further and further outside their comfort zones as they reach for bigger and better goals.